I always fascinated retro-styled motorcycles and classic roadsters. They were meant to be enjoyed at every moment, sailing easily on a coastal road. I do like sporty looking bikes, but a classic has its unique aura that is best kept without many modern touches. 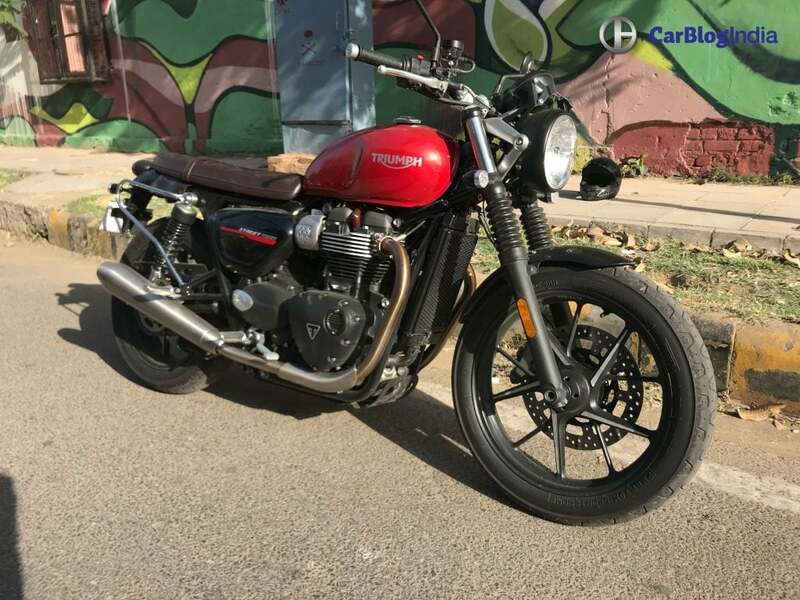 Triumph launched the 2019 Street Twin recently this year, giving some minor visual updates and major engine revamps. The engine is now more aggressive and quick on its toes. Although, the torque figures and engine capacity remain the same. We thought of taking the British Classic for our road test review, and here we are. 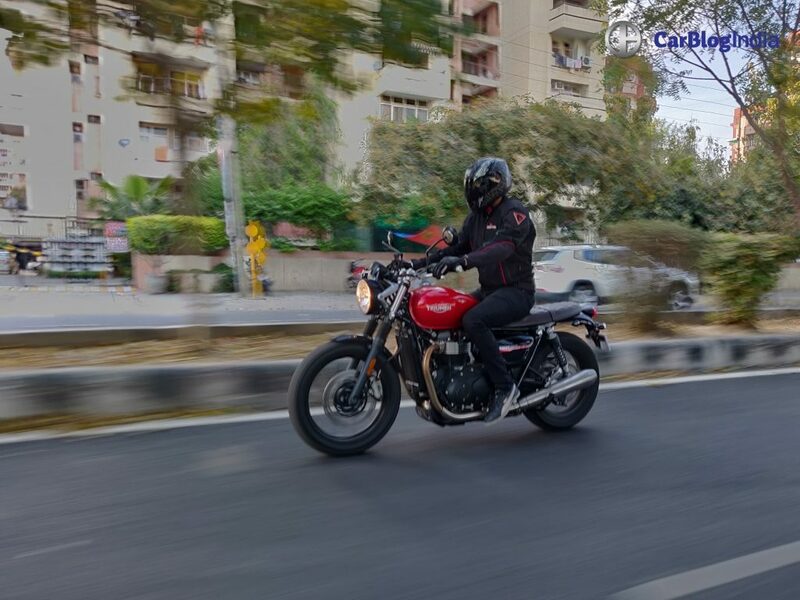 We put the 2019 Street Twin through our daily exercise, as we test its performance, acceleration prowess, its handling and whether it fits right in the Indian market, despite the heavy pricing. I would suggest you not to judge the Street Twin by its name. 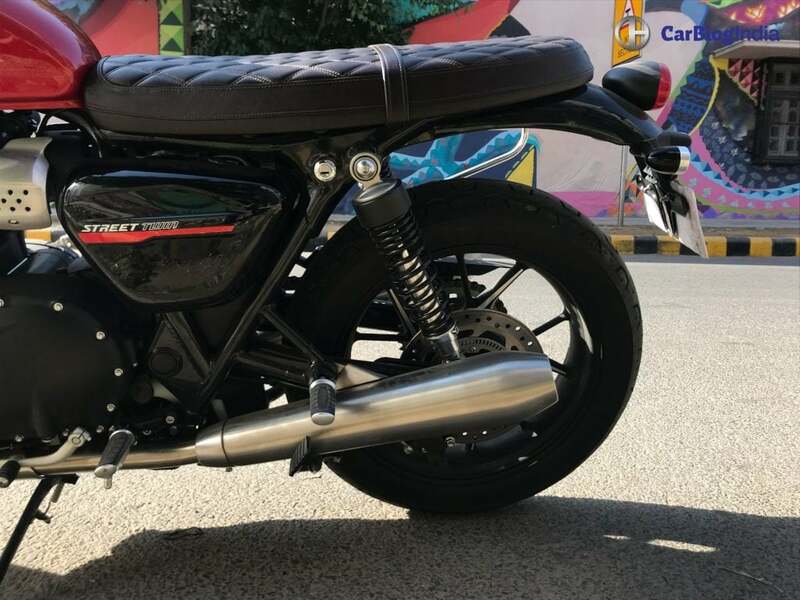 Yes it qualifies as a roadster, but is a retro-styled modern bike. The overall silhouette is off the older British roadsters, but with electronic aids, modern engine and premium fits and finishes. 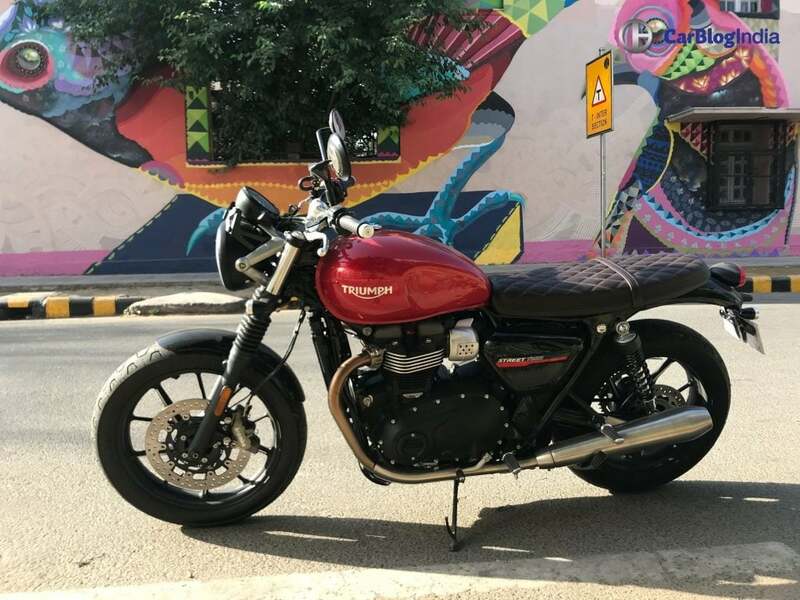 The 2019 Triumph Street Twin gets minor visual updates. The design of the alloy wheels, ‘Street Twin’ logo and the decals on the fuel tank have been refreshed. The headlamp covering is new and it gets a blacked out bezel. Just as you swing your leg over, take a seat on the bike, you might feel that it looks so elegant. 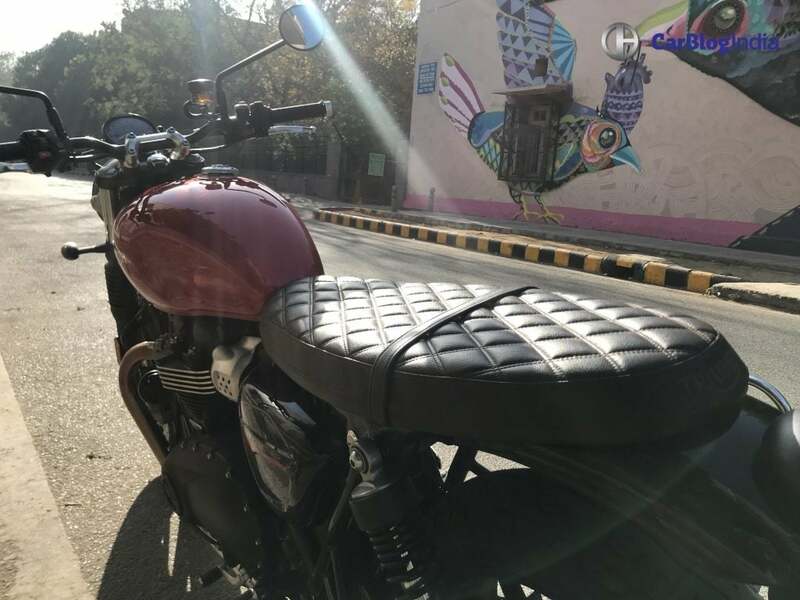 The teardrop-shaped fuel tank, single flat seat, brushed twin-exhaust mufflers and our Cranberry Red colour just complete the package perfectly. Some bikes are meant to be simplistic in their design, while some are expected to be all jazzed up. 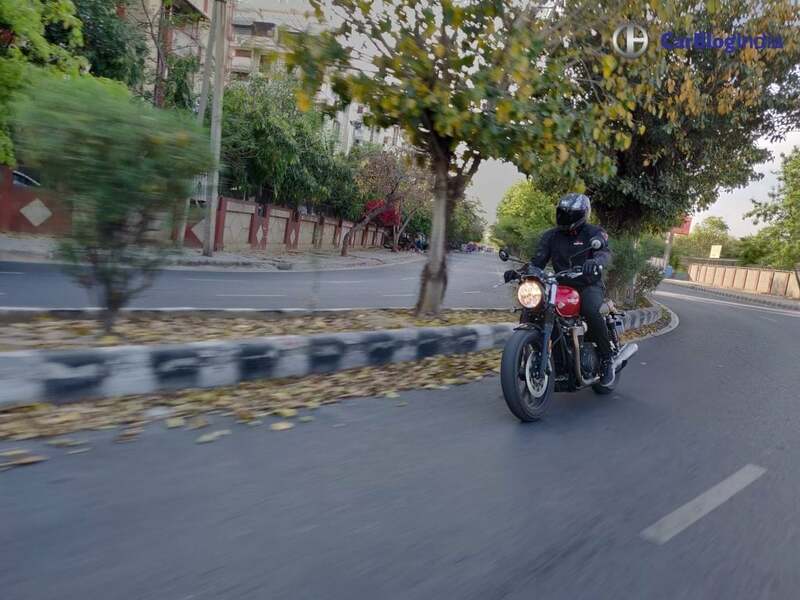 Here, Triumph has left no stone unturned to make the heads turn. 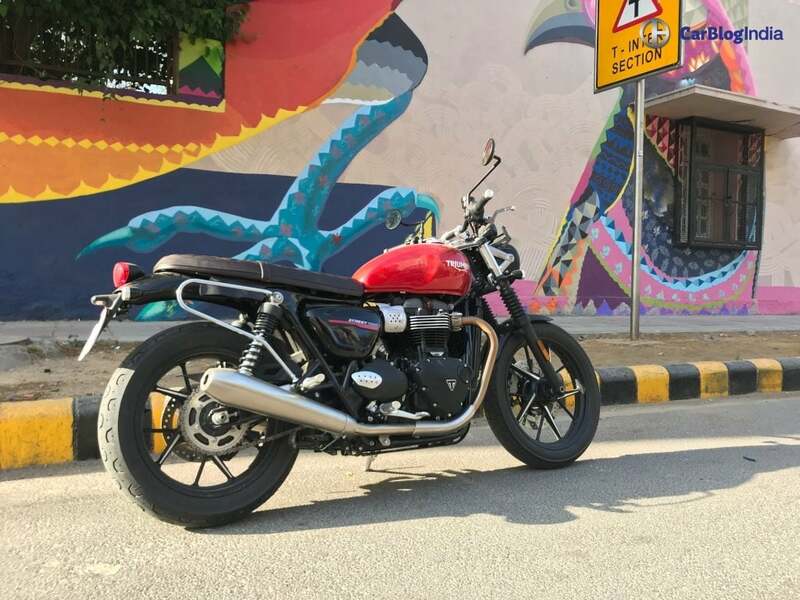 The 2019 Triumph Street Twin uses the same 900cc liquid-cooled 8-valve parallel-twin cylinder engine. However, the power and torque figures have been raised by 18%. It now produces 64.1 BHP at 7500 RPM and the same 80 Nm of peak torque but right from 3800 RPM. The updated bike now gets a lighter crankshaft and magnesium cam covers, thus aiding the increased power. We could see that the engine demands to be revved up hard and can be seen accelerating very fast. The torquey engine is very lively and jumps even at the slightest of throttle twisting. To be frank, the bike was very aggressive and would reach triple speeds in a blink of an eye. It felt like an untamed lion, forced to live in the concrete jungle. The torque generation is spread throughout the range and being a 900cc motor, it could easily pick up at low speeds on higher gears. For example; I could smoothly accelerate, without any undulations, from 30 km/hr on the 4th gear. That’s old school riding for you! It’s not like that the torque is concentrated at just the higher-range, but that’s where the magic happens. Till 3500 RPM, you stay calm, thinking its a modern classic and will follow smooth acceleration. Go above it and you will see a sudden rush of power, that literally gave me an evil grin. 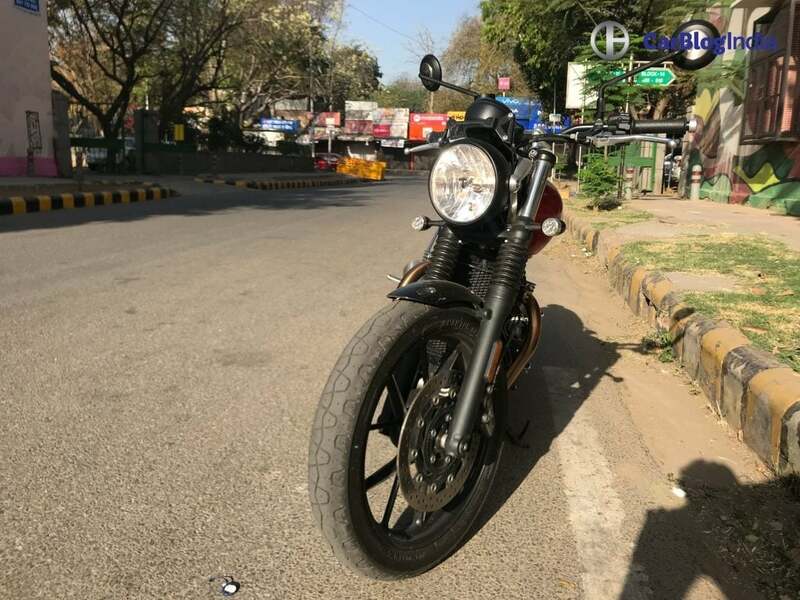 The top speed achievable on the 2019 Street Twin is 180 km/hr, which is alright, given its nature of riding. The bike is comfortable cruising all day between 100-120 km/hr. Even after the said speed, the engine does not run out of breath and packs the punch up till 7500 RPM. 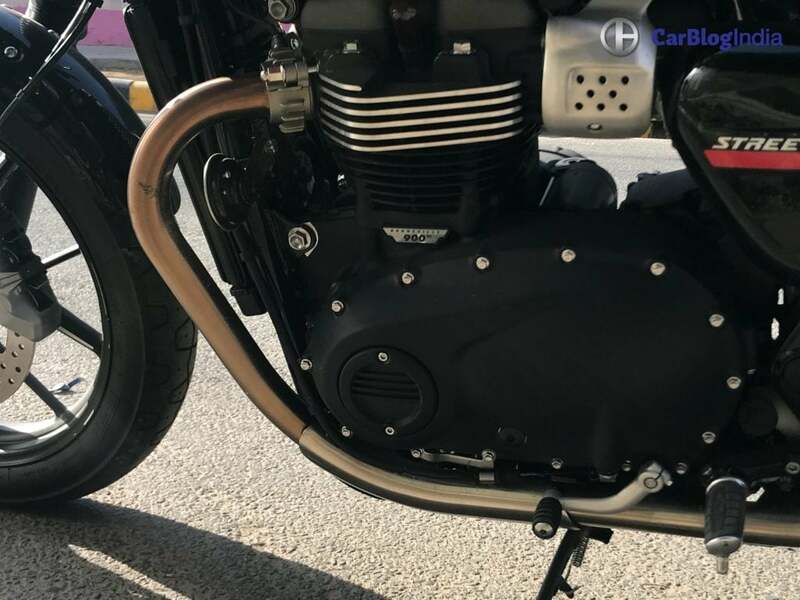 The dual-exhaust muffler emit the sweetest exhaust note, reminding me of the older British twin-cylinder motorcycles. You might want to stay low at nights, as the dogs might just bark at you. The bike comes mated to a 5-speed gearbox transmission with torque-assist clutch. The gear changer was a bit heavy and noisy. As said earlier, the longer gear ratios ensures that you do not have to change the gears every now and then. The torque assist clutch is sort of a semi-automatic clutch. At considerable speeds, for better acceleration, you can change the gears without pressing the clutch. No jerks were felt at mid-range and high-range RPM, but definitely below 2000 RPM. Triumph has equipped the 2019 Street Twin with two riding modes – Road and Rain. The RAIN mode can be switched on when you find it difficult to handle the bike on wet surfaces. The throttle responses become dull and traction control kicks in. The road mode uses regular throttle responses. 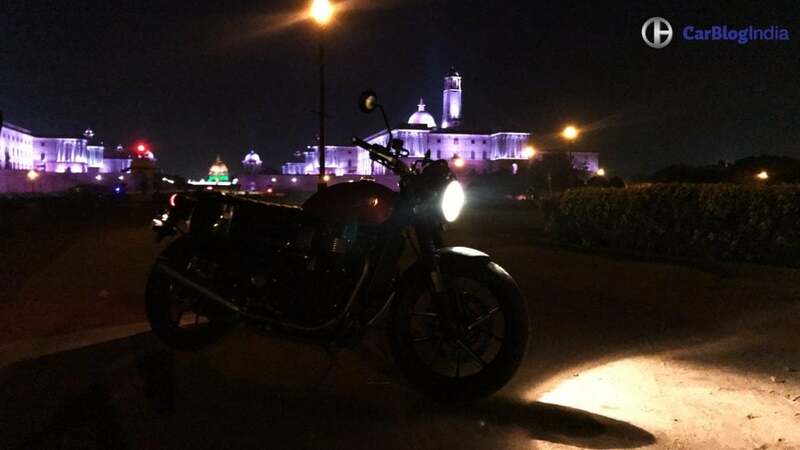 We were able to achieve fuel economy of nearly 19 kmpl in the city and up to 22.3 kmpl on highways on the 2019 Triumph Street Twin. In the heavy stop and go traffic, the mileage drops drastically. I could literally see the riding range falling right from 140 kms to 100 kms in just 3-4 kms on traffic. Of course, with the smooth riding, it came up gradually, but not to the original figure. If you keep riding it on the clutch or 1st and 2nd gear for a long time, it affects the mileage. But what can we do if the traffic doesn’t permit us to go higher? With a fuel tank capacity of 12 litres, you can get a riding range between 200-230 kms, combining the city and highway travel. 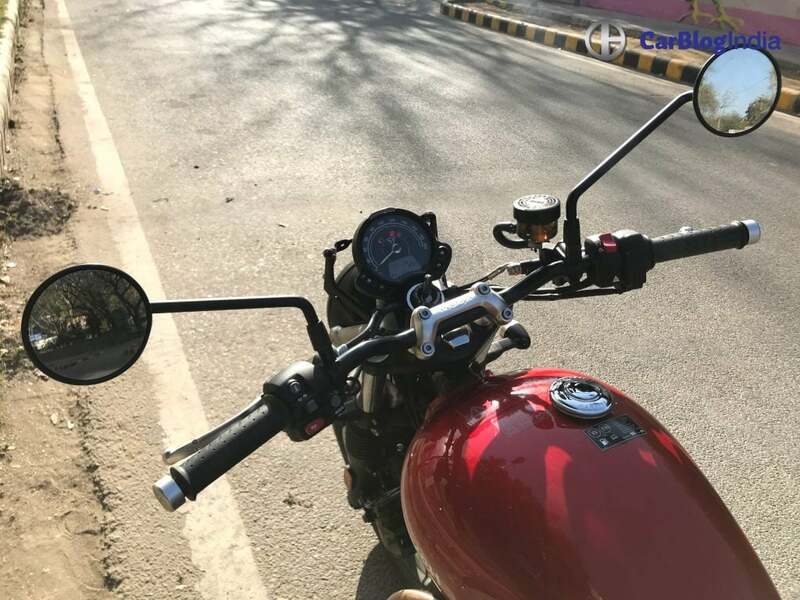 Triumph Street Twin gets a single-piece handlebar, which is placed lower. The riding position offer is complete upright. The foot pegs are front-set, justifying the relaxed riding posture. The very first thing that I hated about the bike was its seat. It looks cushioned, but is not. Within barely 30-40 minutes of riding, by bottoms were aching. While coming home, I usually take 1 and a half hour, and trust me, I had to adjust myself a couple of times to stop the pain. For a bike that is a good weekend companion, the seat could have been better. For the pillion, there was no grab rail to hold on to. Even the back seat person was complaining about the stiff seats. Although, the seat was big and accommodating for two fully grown adults. For suspension, the Street Twin uses new 41mm KYB forks at the front and twin shock absorbers at the back. It would easily soak up damaged roads and minor potholes. The overall riding was plush, sending no jerks to the spine as such. Another thing that disturbed my expected comfortable ride was the engine heat. The engine heat was so bad that I literally thought of it as a heater in the winters. In India, where the temperature in day touches 40 degrees, the heat blasts were too much to handle. 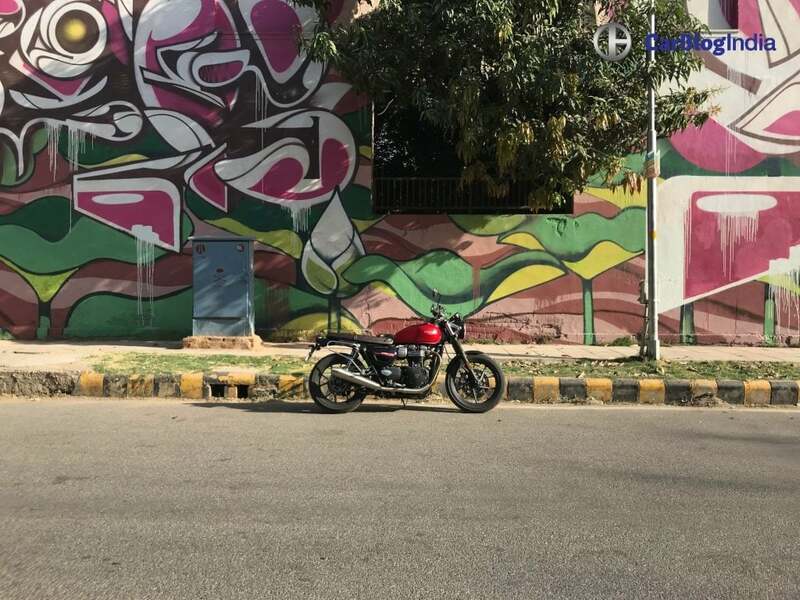 I had ridden the earlier-generation Street Twin for a brief time, and I found no major changes in the handling. It felt a bit more composed, but hard to notice if not stressed on it. The 200-kg kerb weight of the bike ensures that this bike is not meant for your zip-zapping. Overtaking and cornering is difficult and takes confidence to do it. Anyhow, such bikes are meant to be cruising and not for aggressive riding. Coming on to the tires, the Street Twin uses Pirelli Sport Comp tires, which do the work. Since you would not be zip-zapping it, the grip is sorted. Although, I wouldn’t mind slightly stickier tires. 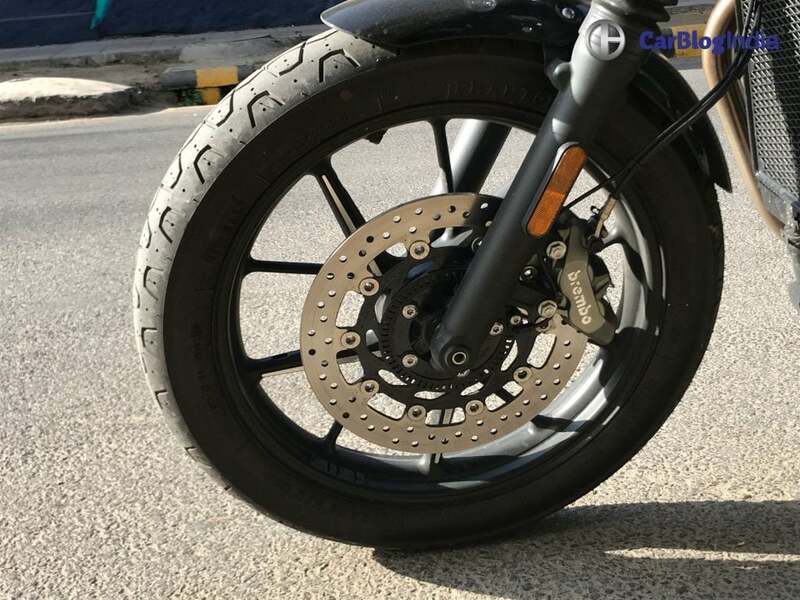 For braking purposes, the 2019 Street Twin uses a single 310mm Brembo disc at the front and a single 220mm disc brake from Nissin, paired with dual-ABS. The bite of the brakes is decent and coming to a standstill from triple speeds was never a problem. Since its a Triumph, you might expect many features onboard. Personally, on a classic motorcycle, I would like everything old-school and Triumph here, has managed to balance that out. For starters, it gets a single-pod analogue speedometer with a digital readout. 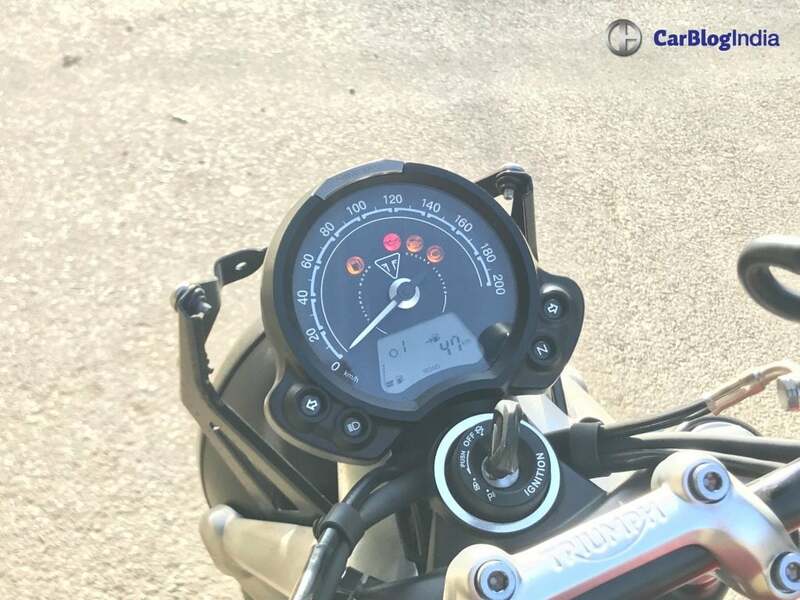 The display shows information such as riding range, average mileage, instanteous mileage, trip meter, odometer, fuel reading, gear position indicator and the modes. It gets All-time on headlamp, which is illuminated to its best. The coverage of the light is strong even without high-beam lamps. There are switches for modes, changing the information displayed on the digital readout and hazard lamps on the handles. Additional accessories purchasable include security alarm system, heated grips and tire pressure monitoring system. At an asking price of Rs 7.45 Lakhs (ex-showroom), it is cheaper than the older generation by Rs 25000. Street Twin goes against the likes of Ducati Scrambler Icon and Harley Davidson Street Rod. Yes, we loved the Street Twin, and I personally would like it in my garage. But, I would avoid putting it through as my daily ride, mainly because of the stiff seat and aggressive nature. A comfortable touring seat from the accessories should help nicely. Talking about its aggressive nature, there are no complaints about it. Overtaking in the city and sudden speed bursts are superb and exciting, but a long empty highway is what the bike needs. At this exorbitant price, would you consider paying for this bike? For all the extra amount that it demands over its rival, it would be a great buy considering the buyer’s love for a Modern Classic.